After leading the Pac-10 in punting, Kirk Maggio would be drafted by the Green Bay Packers in the 12th round of the 1990 draft, but was be cut during the preseason by them as well as the Saints. He was quickly drafted in the second round of the positional draft of 1991 by the Birmingham Fire of the WLAF. Notably, during the 1991 season he’d fake a punt and complete a pass to runningback Ken Bell for 65 yards and a touchdown. By season’s end, Kirk’s 41.9 yard average was third in the league and his net average of 36.0 led the WLAF. He’d also manage to drop 20 kicks behind the 20 yard line. Kirk would be rewarded for his efforts by being named second team All World League that year. Maggio returned to the Fire for 1992, and punted roughly half as many times as 1991. He’d still manage to check in with a 41.9 yard average and a booming 60 yard kick and a 34.3 net average but did not finish among the top three in any category. 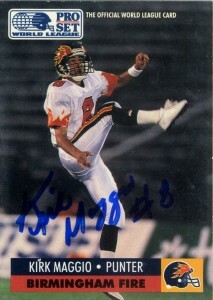 I’d get his autograph after the Riders finally beat the Fire in San Marcos in 1992. It was an extremely humid night game, and he like many players were kind enough to sign cards as the teams left the field. This is a great card, and Pro Set did a great job of really making even this punter’s card look exciting, but note the vacant stands in the background underlining the WLAF’s financial and perception woes in the United States that would lead to the league being folded after the 1992 season. Since the WLAF, Kirk has moved back to his home state of Maryland and put his design degree from UCLA to good work. He has become quite a good painter, especially of sports figures and NFL players. You can visit his website at: http://paintingsbymaggio.com/.